Today, day 2 of body weight workout week, I will post several aerobic body weight exercises. These are great when you want to get a cardio workout in but can’t go outside to run (like during Hurricane Sandy) or to the gym (cause they are packed). I also find that aerobic body weight exercises are more interesting than just pounding the treadmill for an hour. Start in a push up position, keep one foot back but then position one foot up near your hand. Then jump with your legs while keeping your hands on the ground and switch your legs so the foot in the back is in the front near your hands and the foot that was near your hands in now back. Now jump again and switch your legs again. Each time you jump twice and get back to the original position, it is one rep. Start with a set of 10 reps if you are new, eventually work your way up to sets of 25 or more. I actually couldn’t find what the actual name for this is but it is a great exercise that works your whole body. Start out on all fours with your right hand out front and your right foot all the way back. Your left hand should be as far back as possible with your left foot as far forward as possible. The result is your left hand and foot should be very close (though don’t put your left foot in front of your left hand) and your right foot and hand as far apart as possible. The first crawl you will move your left hand forward and at the same time your right foot forward so that now your right limbs are near each other and left limbs are far apart. Next you will move your right hand and left foot forward so you are in the starting position. Do the fitness crawl for ten yards rest for 30 seconds then crawl for another 10 yards. Teach yourself the crawl at a slow pace, it is very confusing movement at first. 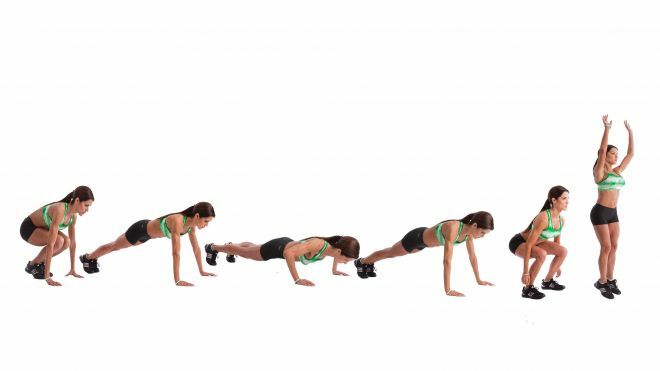 The Burpee is one of the best, and most hated, aerobic exercises. It is pretty challenging and gets your heart rate going. Start out standing up, then squat down until your hands touch the ground. Then kick your legs back so you are in a push up position and then do a push up. Jump your legs forward so you are back in a squat position, then jump up as high as you can and land back on your feet. At this point you will be back in the starting position, this is one rep. At first even doing 10 burpees in a row will be a challenge but eventually you can work your way up to doing sets or 20 to 25 reps. If you are already in great shape and can do more than 25 burpees then these exercises by themselves may not challenge you. Don’t worry, I have more extreme versions for you to try. For the fitness crawl, after you crawl your first 10 yards, instead of taking a rest, do 10 push ups. Then crawl another 10 yards and do 10 mountain climbers. Keep doing this until you collapse in a puddle of your own sweat, it shouldn’t take long. If you have mastered the normal burpee then I have an alternative which will hit every muscle in your body and have you gasping for air. Do the standard burpee except you will be doing the burpee underneath a pull up bar. When you jump, jump up and grab the pull up bar and do a chin up. For this you need a high up pull up bar, not like the crappy type you can put in your door frame. The door frame pull up bars aren’t high enough nor can they support your weight from the jump. This super burpee will not only work your lower body, chest, shoulders and triceps like a normal burpee but will also work your back and biceps as well. lol fitness wayne this is too much cardio. Are you actively trying to kill your gains now?